Fast forward to 2011 when after 1000’s of hours were spent learning his craft and dozens of clips uploaded to YouTube, Chris was awarded the accolade of being one of the top undiscovered guitarists worldwide by the acclaimed international music photographer Robert Knight; who in partnership with guitar manufacturer Fender was searching the globe to find the next great guitarist. In 2013, Chris’ online popularity began to soar, after gaining millions of hits on YouTube he quickly established himself as Twitter’s most followed blues guitarist worldwide, such interest encouraged Chris to self- produce and release his first single entitled: ‘Lipstick On Her Cigar’. On the 20th November the single hit No.1 on the iTunes &Amazon Blues charts, after just one day of sales. In 2014, huge public demand for live performances led Chris to form his own 4-piece group: ‘The Chris King Robinson Band’ which quickly gained recognition as one of the most exciting live bands in the country. 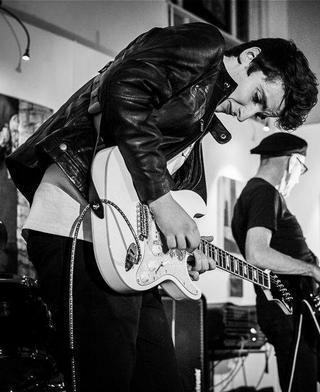 2015 was a defining year for Chris as fresh from a hugely successful 2 week Tour of the USA his debut EP ‘Tell Me Why You’re Scared’ set the Blues world alight by flying straight to No.1 on both the Amazon and iTunes album charts. An in-depth feature in The Blues Magazine at the end of the year (November 2015) which discussed his chart success, song writing, playing style and influences further enhanced Chris’s reputation as a guitar hero in the making, his track “Why Don’t You Give Me Your Love” was featured on the magazine CD.